Facebook on Wednesday briefed journalists on its latest attempt to stop fake news during the election season, offering an exclusive tour of a windowless conference room at its California headquarters, packed with millennials monitoring Facebook user behavior trends around the clock, said The Verge. 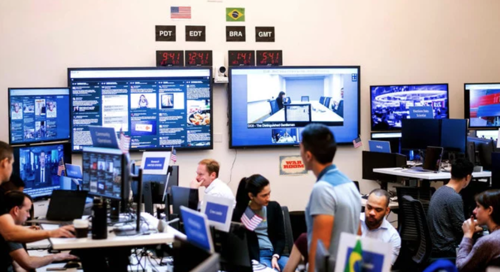 This is Facebook's first ever "war room," designed to bring leaders from 20 teams, representing 20,000 global employees working on safety and security, in one room to lead a crusade against conservatives misinformation on the platform as political campaigning shifts into hyperdrive in the final weeks leading up to November's US midterm elections. The team includes threat intelligence, data science engineering, research, legal, operations, policy, communications, and representatives from Facebook and Facebook-owned WhatsApp and Instagram. 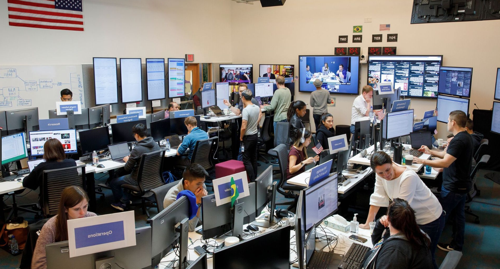 "We know when it comes to an election, every moment counts," said Samidh Chakrabarti, head of civic engagement at Facebook, who oversees operations in the war room. "So if there are late-breaking issues we see on the platform, we need to be able to detect and respond to them in real time, as quickly as possible." This public demonstration of Facebook's internal efforts comes after a series of security breaches and user hacks, dating back to the 2016 presidential elections. Since the announcement of the Cambridge Analytics privacy scandal in March, Facebook shares have plunged -14.5% It seems the war room is nothing more than a public relations stunt, which the company is desperately trying to regain control of the narrative and avoid more negative headlines. 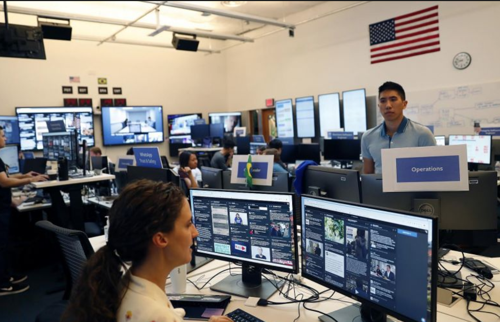 The war room is staffed with millennials from 4 am until midnight, and starting on Oct. 22, social media workers will be monitoring trends 24/7 leading up to the elections. Leaders from 20 teams will be present in the room. Workers will use machine learning and artificial intelligence programs to monitor the platform for trends, hate speech, sophisticated trolls, fake news, and of course, Russian, Chinese, and Iranian interference. Nathan Gleicher, Facebook's head of cybersecurity, told CNBC the company wants fair elections, and that "debate around the election be authentic. ... The biggest concern is any type of effort to manipulate that." "Content that was telling people that due to protest, that the election would be delayed a day," said Chakrabarti. "This was not true, completely false. So we were able to detect that using AI and machine learning. The war room was alerted to it. Our data scientist looked into what was behind it and then they passed it to our engineers and operations specialist to be able to remove this at scale from our platform before it could go viral." The war room has been focused on the US and Brazilian elections because it says misinformation in elections is a global problem that never ends. Gleicher warns that Facebook is observing an increased effort to manipulate the public debate ahead of US midterms. "Part of the reason we have this war room up and running, is so that as these threats develop, not only do we respond to them quickly, but we continue to speed up our response, and make our response more effective and efficient." Gleicher adds that it is not just foreign interference but also domestic "bad actors" who are hiding their identity, using fake accounts to spread misinformation. "This is always going to be an arms race, so the adversaries that we're facing who seek to meddle in elections, they are sophisticated and well-funded," said Chakrabarti. "That is the reason we've made huge investments both in people and technology to stay ahead and secure our platforms." Big Brother is watching you: surveillance by corporations is the new America.